Whether you’re working with Adobe Photoshop®, Adobe Premiere® Pro or Microsoft® Excel, you are a creator and you want that feeling of being in your element, deeply connected to your work, and in your creative flow. Today we’re introducing a revolutionary new flagship keyboard, Logitech® CRAFT Advanced Keyboard with Creative Input Dial to give you complete creative control. 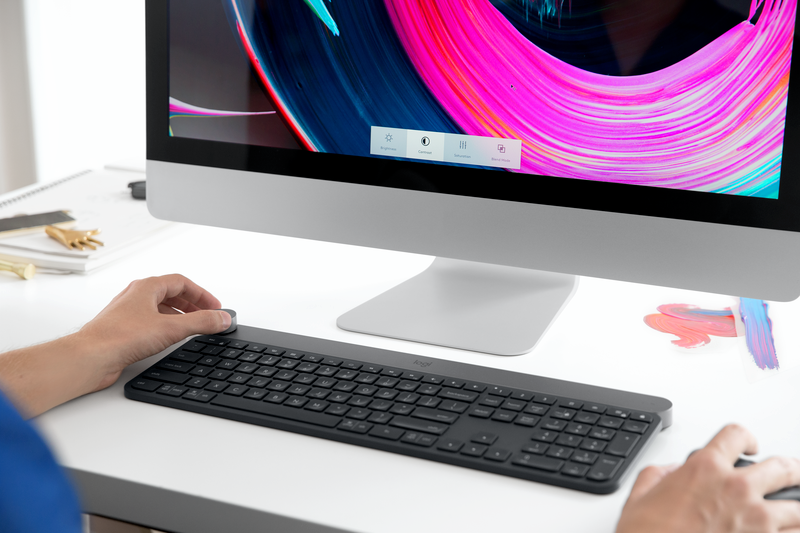 We are very excited to introduce you to CRAFT, the first keyboard to feature a creative input dial, called the Crown, which allows you to get things done faster and with a greater sense of control than ever before. The Crown recognizes the apps you use and gives you access to the tools you need with a touch, tap and turn. Stay in your element by adjusting image brightness, contrast and saturation in Adobe Photoshop, or create and adjust charts in Microsoft Excel with a quick flick of the dial. In addition to the most common apps, the Crown allows you to adjust the global settings of your desktop, such as navigating playlists in Spotify®, scrolling through your open tabs or adjusting volume and screen brightness. Using our Logitech Options Software, assign a turn and click function for any app you are using. We will have many more apps available after launch so be sure to keep checking back. Stay tuned for our SDK coming soon, allowing developers to optimize their software for use with the Crown. CRAFT features smart illumination with backlighting, detecting your hands and adjusting the lighting automatically depending on the room conditions. The keyboard is designed for comfort, with a full-size familiar layout, with each key engineered for efficiency, stability and precision. And with the touch of our Easy-SwitchTM button, you can switch between – and type on – any three connected devices, whether you are using a Windows® PC or Mac®. CRAFT is designed for the premium desktop experience and complements other Logitech premium accessories, such as the Logitech MX Sound, Logitech Spotlight Presentation Remote and Logitech MX Master 2S. How could CRAFT and its creative input dial help you enhance your creative experience and achieve your goals faster? We’d love to read your comments below.